The Skooma Den is a run-down house in Bravil that acts as a shelter for skooma addicts. It stands in the center of Bravil, above Carandial's house. The door is locked and difficult to pick, but inside is a group of skooma addicts who literally can't stop drinking the stuff, not even while talking to you. 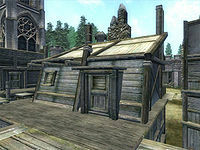 The Skooma Den has beds you can sleep in without payment when the addicts are up and about, and the addicts themselves carry a small fortune in skooma that can be pickpocketed off of them (38 bottles in total between them, with three more to be found in a Wooden Chest). Several of the addicts (specifically, Reistr the Rotted, J'zin-Dar, and R'vanni) have 0 Responsibility and therefore will not report any crimes they witness. Therefore, it is possible to steal items or even murder Skooma Den residents without any consequences (although murder will be noticed by the Dark Brotherhood). However, Roxanne Brigette will report crimes (her Responsibility is 10), as will various visitors to the Skooma Den. Occasionally, Bravil citizens can be heard saying: "I can't believe nothing has been done yet. The place is a skooma den, pure and simple." and "It should be burned to the ground. All those skooma-muddled Khajiit laying around all day... it's disgraceful." S'Krivva is also a member of the Skooma Den Faction. The Skooma Den also appears in Legends. This page was last modified on 22 October 2018, at 19:48.